There is just something about DCC RPG adventures, even the vast majority of 3rd party ones, that keep me coming back for more. 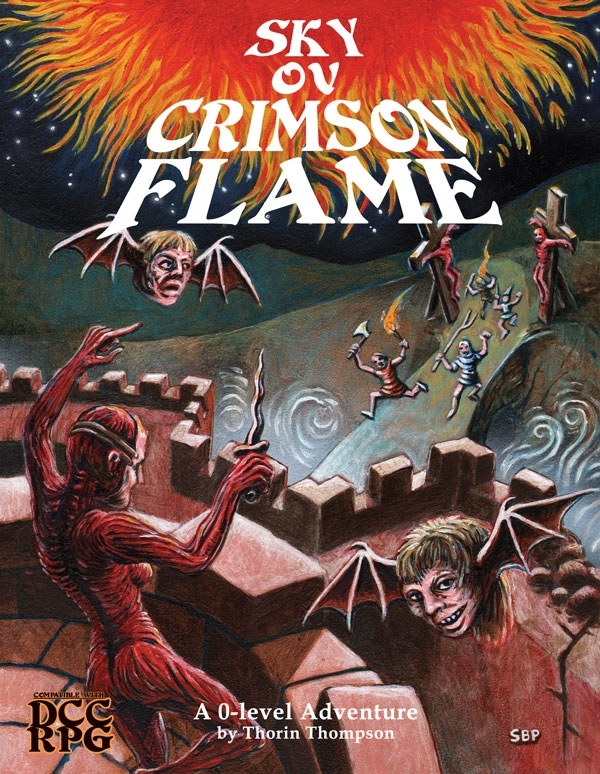 Sky ov Crimson Flame has certainly grabbed my interest. Maybe its the Poag cover. Quite possible it's the fact that its a funnel, and I love funnels. Sky ov Crimson Flame is a 0-level adventure/funnel designed for the Dungeon Crawl Classics RPG, but could also be used with your favorite Old School RPG of choice. In the adventure you will take control of 3 to 4 0-level peasants as they attempt to unravel the mysterious disappearance of their fellow villagers and (if they're lucky) stop a ceremony that'll bring darkness across the land! This adventure was written by Thorin Thompson (that's me) and at a 12,500+ word count it is a brutal bloody good time! 5 Handouts, 2 Maps, 2 Random Tables, & 1 New Spell! Physically, this module will be saddle-stitched, ranging from approximately 28 to 32+ pages and measuring 8.5 x 11 inches. It will feature a full-color card stock cover and sharp black & white interiors on durable paper. Can someone explain the funnel again? I think I have it, but I am not sure. That's what I had heard it told, Erik. It seems complicated to have four guys who are equal to one another. It's not the same as a PC + henchmen for instance. How do you know who you're "really" running? Maybe it's easier than it looks when you're playing. I just think I would pick out one of my guys to be the leader and then favor that guy over the other ones, whether consciously or subconsciously. Has anyone had any real play experiences with a funnel situation they can share? I played in one - might have been with James Macy, but maybe not. My first group of four was killed all at once (along with many others) when we triggered a deadfall trap on the *approach* to the castle we were supposed to investigate. The second funnel group of four did a lot better (we'd learned some caution). You play them as they are (and the characters are simple but different enough to allow it), and they gain character for the main game by virtue of the events that happen in the funnel. It's a clever way to avoid some of the pitfalls of pre-planned, sometimes overly cautious/optimized character generation. Done a couple of Zero-level funnels. Basically you have a gang of expendable PCs you aren't attached to in any meaningful way. There isn't a whole lot of character development or even a lot to do to create a PC and if any survive then you get to start off as a 1st level character where you choose a class, etc. The funnel is great! And it's presumed(as they are normal humans with 1-4 hp) that most(if not all)die during the fist adventure. I've run a funnel for my group and it was great(!)fun. Install Crawler's Companion from Purple Sorcerer Games as it has a character creator to get an idea of what 0 the lvl characters one can play. Demihunans are classes (as in BECMI). And since not all characters are equal I'd guess most players will to try to save the best statted one... though that not always an option. Hey! Thanks for posting and backing my adventure! Speaking of Whitman - Heeeeeeres Kenny!